For OEMS to be competitve and meet the needs of their end use customers, there are 3 main areas that are looked at when choosing the supporting components for their equipment. For more than 60 years, we have been helping guarantee production safety for OEMs and end users throughout the world. Sensitive control technology needs to be protected from many environmental conditions. With NEMA Type 4/4X, IP 56 protection, our cooling units satisfy the toughest environments. Pfannenberg innovation has made it one of the largest globally operating manufacturers of thermal management and process cooling equipment today. Our wide product range includes complete system solutions for machine and enclosure cooling along with visual and audible signaling devicesfor events that require alarm, warning or indication notifications. Support... when and where it's needed – In addition to manufacturing facilities location on three continents, Pfannenberg has developed a worldwide network of local subsidiaries and sales/service partners eager to meet your service needs and help you select the correct solution. If maintenance of your enclosure cooling system is required you can expect immediate assistance from Pfannenberg. Our repair service affords you the fastest possible response – nationally or internationally. We ensure that your cooling system is returned to optimal condition – even if it’s not a Pfannenberg product. Our on-site service gets you back on-line faster, eliminating the transit time associated with factory repair programs. company, we can develop products quicker than the competition while optimizing the solution for that specific industry group's requirements. The high performance of our products comes from years of research and design experience. 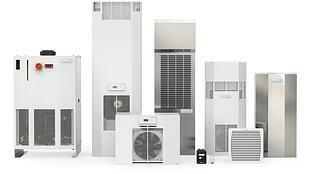 Trust us to be the experts in your industry to provide you with the proper cooling solution. Have a question regarding which equipment is best for your application? Ask Us Here.